Warren Street Underground (5 mins walk): Northern, Victoria Euston Square Underground (5 mins walk): Circle, Hammersmith, Metropolitan Great Portland Street Underground (5 mins walk): Circle, Hammersmith, Metropolitan Euston Underground & Overground (10 mins walk): Northern, Victoria Regents Park Underground (10 mins walk): Bakerloo line Kings Cross Underground & Overground (15 mins walk): Circle, Hammersmith, Metropolitan, Northern, Piccadilly, Victoria. Chris Horner converts and transforms found objects in a process of unravelling; creating new objects from art and building materials. His experimentation with medium and surface conveys an organic and tactile notion of transformation. His labour and work deals with unpredictable and chance happenings by combining art making with construction work. 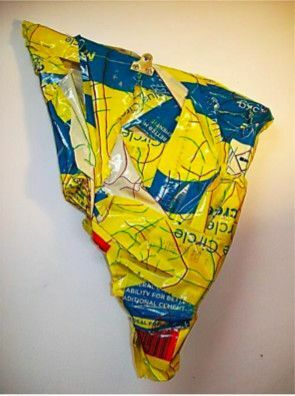 The Remnant sculptural paintings focus on them es such as value or appreciation of an object, and collaboration between chaos and order through the inclusion of colour, shape, and space. Chris Horner is a British artist who lives and works in Hampshire and has received a BA and MA in Fine Art at the University for the Creative Arts in Surrey, UK. In May 2017 his work was selected for HLS Gallery’s International Arts competition in Venice 2017, and an international art fair in London.